You've likely seen professionals wearing it during training sessions or revealing it during impromptu goal celebrations, but now Catapult Sport's Playertek compression vest is making its way to grassroots football. The result is players in Sunday leagues, five-a-side teams and everything in between tapping into heat maps, the distance they've covered during a game, how many sprints they burned through and their top speed – all through the power of a tracking pod that's worn inside a compression crop top. But how does it work in the cauldron of a midweek five-a-side game? Well, Team Wareable strapped on the smart compression vests to find out. The first step on your way to tracking in-game activity is pairing the Playertek sensor with the companion app, before slipping it into a rubber case and then into a pocket located the back of the vest. Once you tap the button on the device and see two green lights flashing, you know you're good to go. I pulled on the vest and began tracking a light warm-up and the first of two 14-minute matches. Once you want to stop, all you need to do is hit the same button and head to the app to sync up your session. This takes a couple of minutes and provides you with snapshots of your session once you've named it, chosen the match result, and interestingly, selected the pitch you just tore up. This uses Google Maps to help you pinch the total area of the field, and will remain saved within the app for future use. Once you've added your saved session, you're also given a percentage based on how it compares to a professional footballer at the same position. 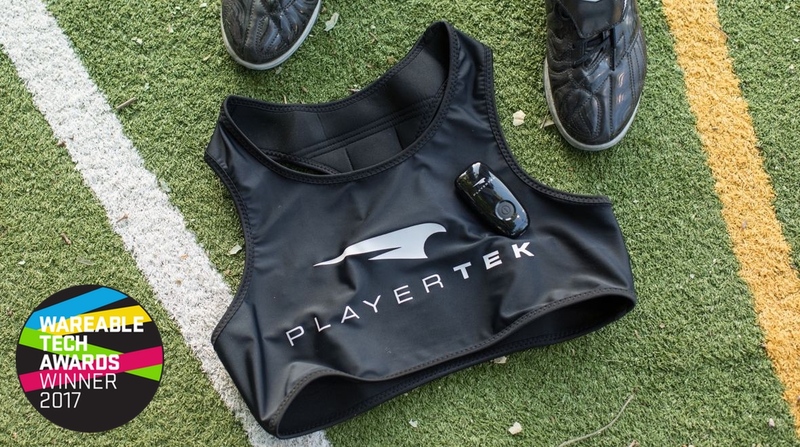 In the heat of a game, the Playertek vest isn't something you're overly conscious of – even when I took the odd tumble, the sensor went unnoticed and never felt like it was ready to jetpack from the vest. But in the background it's tracking your every move in order to provide a post-game picture. Your halves will be split in order to display how your performance compared (in my case, it dropped significantly in the second half of the 14-minute games), with a five minute breakdown of your distance, top speed, sprints and sprint distance provided. Of course, these insights are limited somewhat by how short the games were and how positions are often mixed in the likes of five-a-side, but it still offers you a fun surface take of your game. Take the game below as an example, where a kilometre was covered on the small pitch. With Catapult now operating in both the professional and amateur football realm, it's important to understand the differences between what's being offered. The company's own Catapult sensor, which is used by the likes of Bayern Munich and Read Madrid, offers a significant hardware difference to the consumer Playertek device. While the positional GPS accuracy is very similar, the elite devices involve an accelerometer, magnetometer and gyroscope to allow for more advanced analysis of a player's physical performance. And while the Playertek hardware is the same whether it's used by individuals or a group, there's a more advanced platform available for coaches who opt for the team solution. This allows for player level comparisons and deeper metrics. The one sprint I recorded was spot on. After losing the ball in the centre of the pitch, the afterburners were needed in order to track back and avoid conceding a goal. Not only was the sensor able to pick up the change in speed and register a sprint (far right image), but it also gave the correct positioning for where this happened and the total distance – impressive stuff. It's not just about looking at your own stats and using them as a base to improve certain aspects of your game; Playertek also has leagues in order to put fellow users on display within a group. This essentially takes all the metrics you have available and puts you in rankings with the rest of the world and friends you choose from – say your own 11-a-side team. There's even a FIFA videogame-style team of the week, which features the top player at every position from around the globe. But the first time wearing the tech, achieving the top speed, covering the most distance or competing with the elites wasn't really on my mind – you're just playing and trying to win. It's only really after you see your name suffering on the leaderboard that the inevitable feeling of competition sets in. Over the course of an entire season, it's definitely something that would act as a motivating factor – especially if you know it's likely to get brought up in the pub or group chat after a game. With Playertek initially being honed towards professionals, moving it to the grassroots scene feels like a natural and sensible progression – after all, this is a game that's played globally and offers little by way of tech for the average Joe. The big plus here is that it doesn't overcomplicate things, especially through the syncing process. And even with regard to metrics, the likes of heat maps, pitch breakdowns and distances are used routinely in televised broadcasts. There's definitely enough depth to keep users fed for now. But, inevitably, there's also room to grow. This is a device that's currently more suited to the 11-a-side game, and rightly so, but seeing some integration tailored for smaller groups would be a solid next step. And within the app itself, being able to set personal or team training challenges would be an interesting way to gamify the platform further. Maybe even AI coaching or real-time prompts could be integrated further down the line, but for now Playertek is providing a simple, fun and engaging way to get more from your time on the pitch.